The subtitle of this Coulter-style "take-no-prisoners" book would suggest a red-meat laundry list of all the left-wing mischief planned or plotted for the downfall of America. Actually, it's mostly about one issue. Some segments of the left-coalition may have in mind literally creating the "hellhole": others may be the sheeplike followers of clever propagandists who mask evil with good-sounding intentions, such as rescuing the poor who seek only to better their lives, and resent those "mean Americans" who are pushing back. Obviously, enemies of our Constitution presume it's their right to kill the Electoral College, which protects us against mob rule; or to call a second Constitutional convention to "revise" (i.e. eliminate) such cherished guarantees as the right to freedom of speech; and to dilute the even-handed the enforcement of our laws, some of which are routinely ignored, as illegal aliens are disproportionately represented in prisons (often before being released again into our midst). One may wonder from what dark motives the ongoing gate-crashing arises. 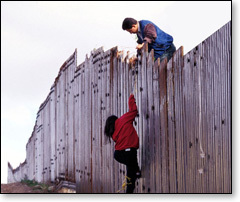 Open borders could lead to violent disasters such as 9/11, only more surprising, and also destruction of our culture. In "Adios, America! The Left's Plan to Turn Our Country into a Third World Hellhole," Ann Coulter defines illegal aliens as the issue she believes towers above all others (as threatening and dangerous as the others are). That is why today's female H.L. Mencken pins this entire book mostly on the invasion of this country from our southern border, an infusion of illegal aliens intended to weaken us and take us down (as expressed here in a paraphrased message to you from those who would make a mockery of our ballot): "So you Americans don't like our candidates well enough to vote for them? Too bad. We'll keep encouraging more and more and more invaders to crash your borders and vote in your elections. "And by the way, if you don't appreciate our ordering you around in your own house, then we would add that, based on reports of OTMs (other than Mexicans) illegally crossing the border, then who knows? Maybe someday, our own invaders will be joined by suicide bombers." "Illegal aliens" is the moniker Coulter applies to those who barge into our neighborhoods; her book offers no credibility to the disingenuous, Orwellian-sounding term "undocumented immigrants." "Mexico had one-party rule for 70 years, and [if President Obama succeeds in carrying out his effort to "transform" America] so will we," the author warns. Ms. Coulter notes that, "Every single elite group in America is aligned against the public – the media, ethnic activists, big campaign donors, Wall Street, multi-millionaire farmers and liberal churches. Their cozy deals won't survive without the votes in our elections from the Third World. Illegal immigration appears to be something of a racket in which both sides of the political street are complicit, the author believes. To say she is skeptical of those whom many of us view as "champions" or "heroes" in the "fight" against illegal immigration is an understatement. Most of them are "sellouts." Half the rest, the author alleges, are incompetent. And she names names. The anti-Americans, of course, are the more ruthlessly political of the two parties. However, at the very time many of their more leftward-leaning leaders are finding fault with the "unfairness of America," they are nevertheless leading a crusade to bring more people from all over the world to come and live here. That's Ms. Coulter's point. It's the votes the U.S. left wants from illegal aliens so they can negate the votes of natives and legally naturalized American citizens. The author fully explains all that in the pages of "Adios, America." Though she doesn't spell it out in these words, Ms. Coulter obviously would not dissent from the widely believed view that as the Democrats are the evil party, the Republicans are the stupid party. What else is one to think when America's so-called "conservative party" is willing to abandon its base so that the left-wing party can pick up the political marbles, leaving the GOP weakened and without enough elected officials to aid employers who are too cheap to pay decent wages to nannies and stoop labor? Congratulations, Republicans. You lose both ways. Here, again, is how Ms. Coulter spells it out: "The practiced liars in the Republican Party know damn well Americans do not want more immigration." But no, the author laments, "To please well-heeled donors, elected Republicans compulsively push for amnesty, in-state tuition, driver's licenses, and welfare payments to illegals." But then, election-time arrives again, and the Republican lawmakers come around with their tin cups expecting the usual bonanza. Oops! What happened to our voters? Hello. Anybody home?